The devil speaks in his native language, which to many isn’t an actual language; it’s just mere sounds and grunts and vomit noises. 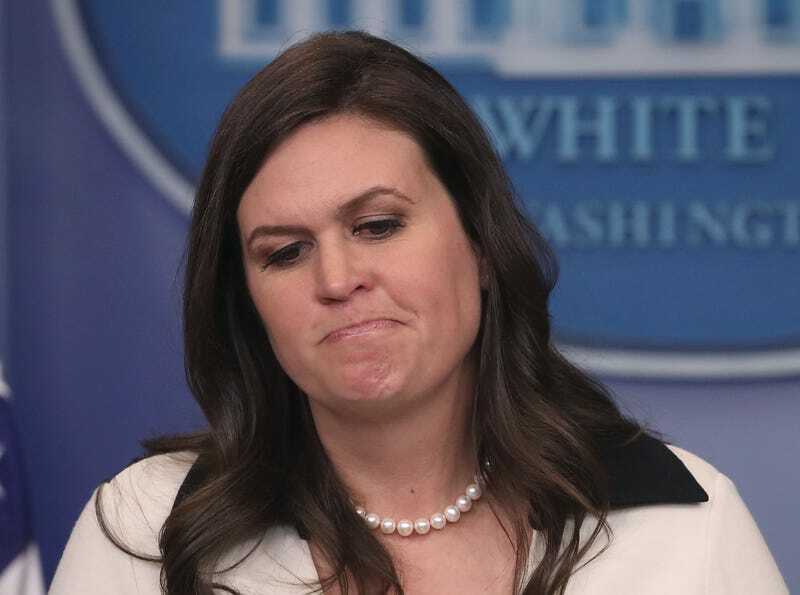 As such, the devil often needs a translator: Enter Sarah Huckabee Sanders, aka Suckabee. One of Suckabee’s few jobs is to translate for the devil, who, for years, has been losing some of his pigment, and instead of being red is just Cheetos-dust-colored. So it makes sense that Suckabee is out here doing the non-Lord’s work. During a press briefing Monday, Suckabee was asked to clarify the president’s comments in which he claimed that even if he didn’t have a firearm, he would’ve run into the Marjory Stoneman Douglas High School during the mass shooting that left some 17 teachers and students dead. The comment came after the president criticized armed officers who didn’t run into the school after hearing the commotion. Let’s be clear: The president is a gilded-chair quarterback. This is what he does, and unfortunately, we don’t need a translator because we fully understand this devil. But that didn’t stop Suckabee from changing the narrative from the president is a boisterous, loudmouth air hole to the president is a boisterous, loudmouth air-hole leader! According to Suckabee, when he said that he would have run into the Parkland, Fla., school unarmed, he wasn’t trying to shame those who didn’t run in but, rather, was saying that his presence alone, as a leader, could’ve been utilized. Watch her do her best devil translation below, and don’t worry about whether she looks at herself in the mirror at night, because she can’t see her reflection anyway.